We offer a diverse selection of air plants. 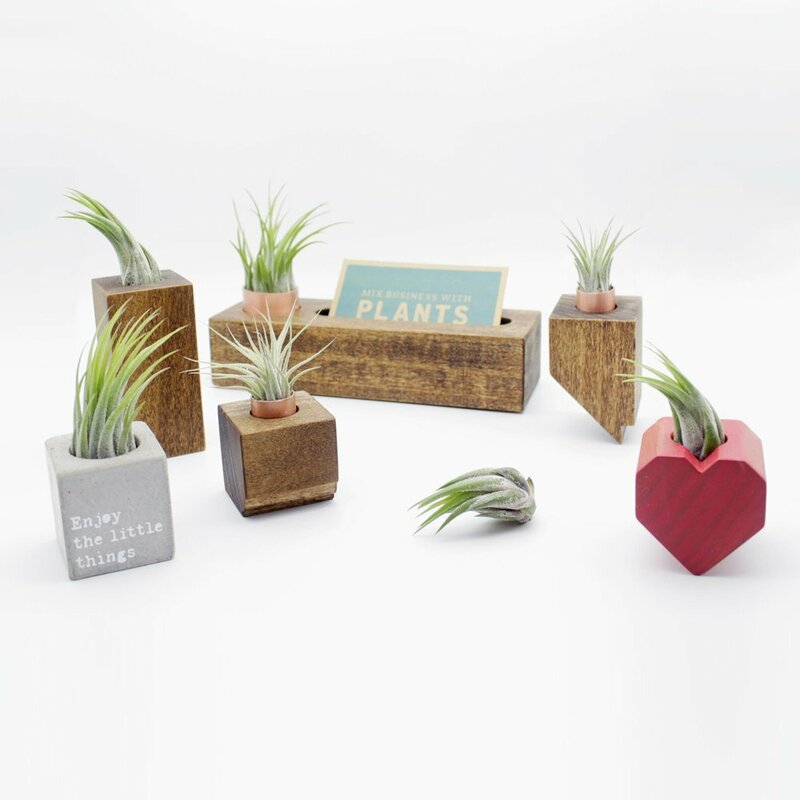 All of our air plant holders include a hand-picked plant that fits best within the holder. We also offer the option to purchase additional air plants if you just can't get enough (we get it!). 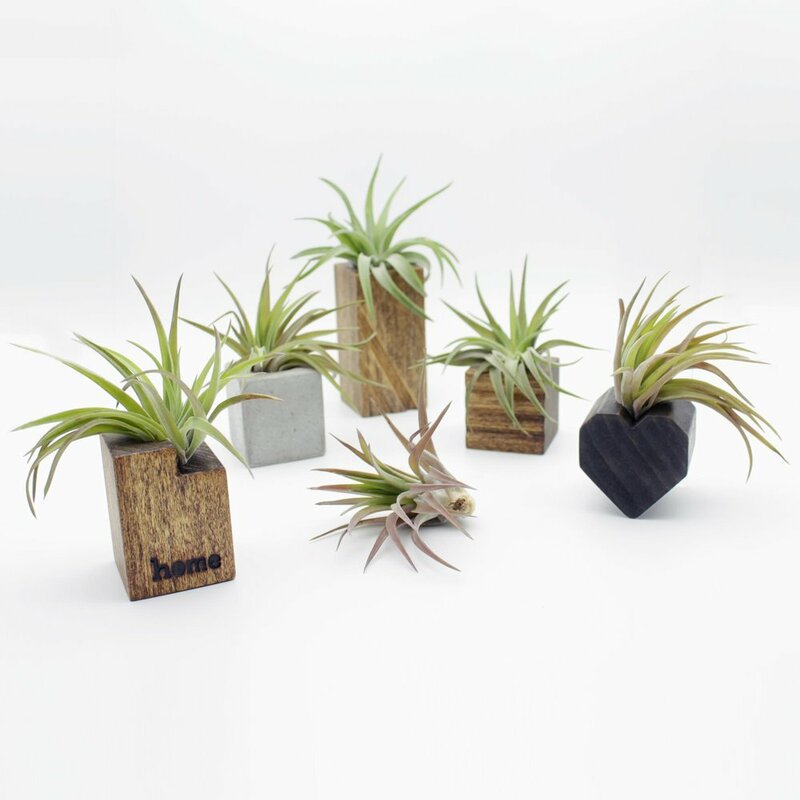 Below is the entire list of the air plant varieties we've carried along with product pairings. 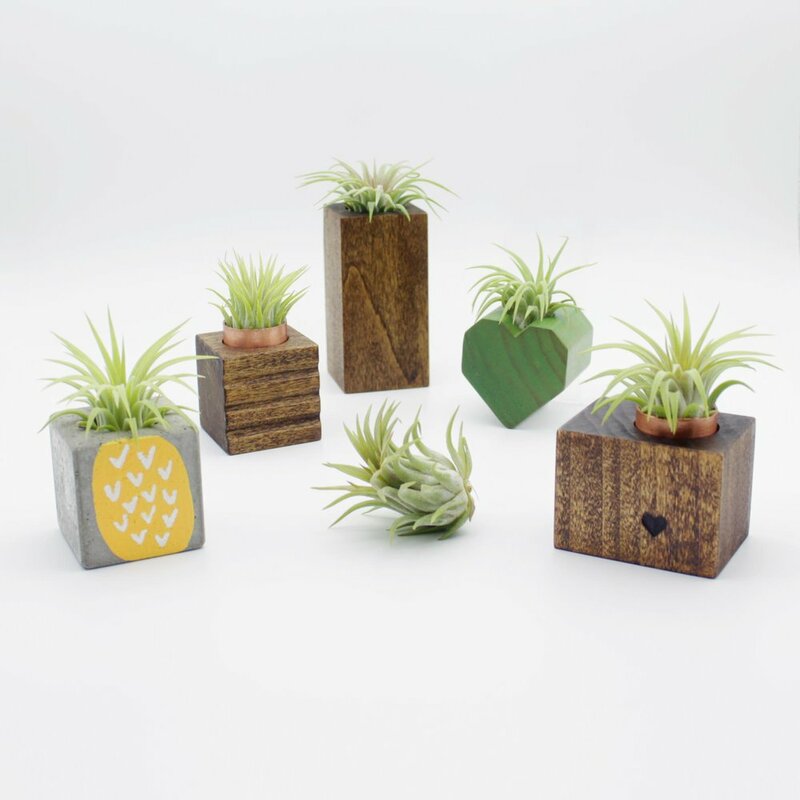 Keeping your air plant happy and healthy. 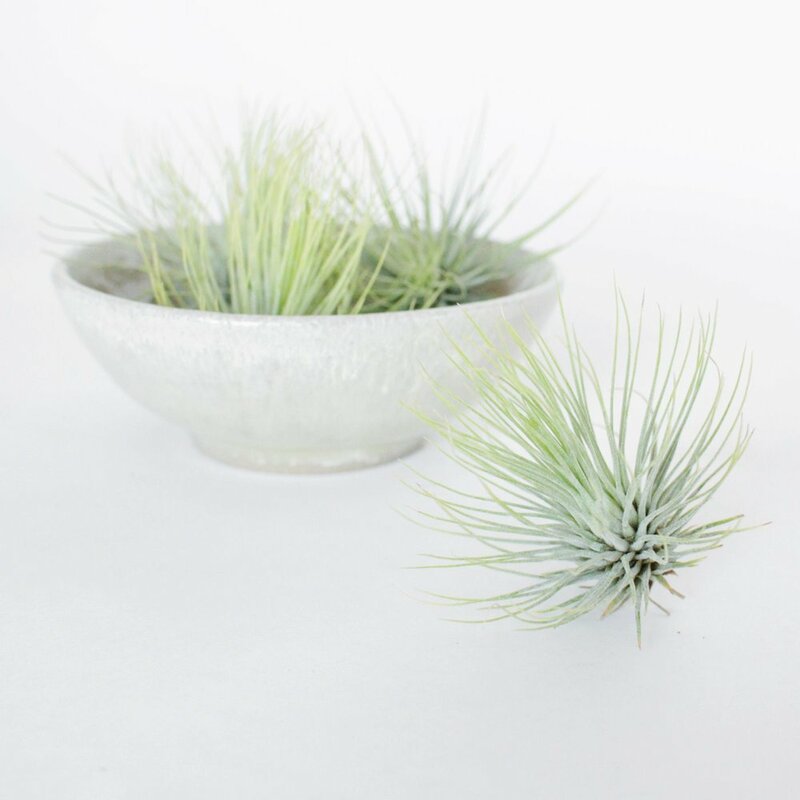 Air plants thrive in bright, filtered sunlight. Too much intense, direct sunlight can dry out air plants. Artificial light can be substituted for natural light using fluorescent bulbs rather than incandescent bulbs and placing the air plant no further than 3 feet from the light source for a minimum of 12 hours per day. How often an air plant needs watering depends on the climate. Hotter and dryer climates require more frequent watering. Cooler and more humid climates require less watering. Keep in mind that heaters and fireplaces dry the air. 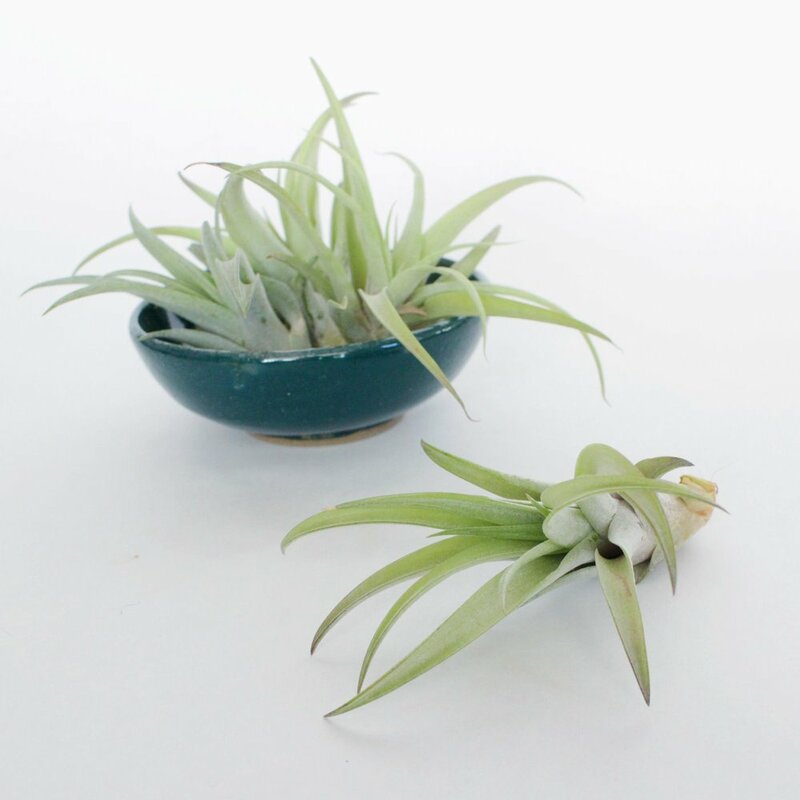 A good starting point is to soak the air plant in a bath of water for 20-30 minutes once a week. After soaking it is very important to gently shake excess water from the plant and turn it upside down to dry. 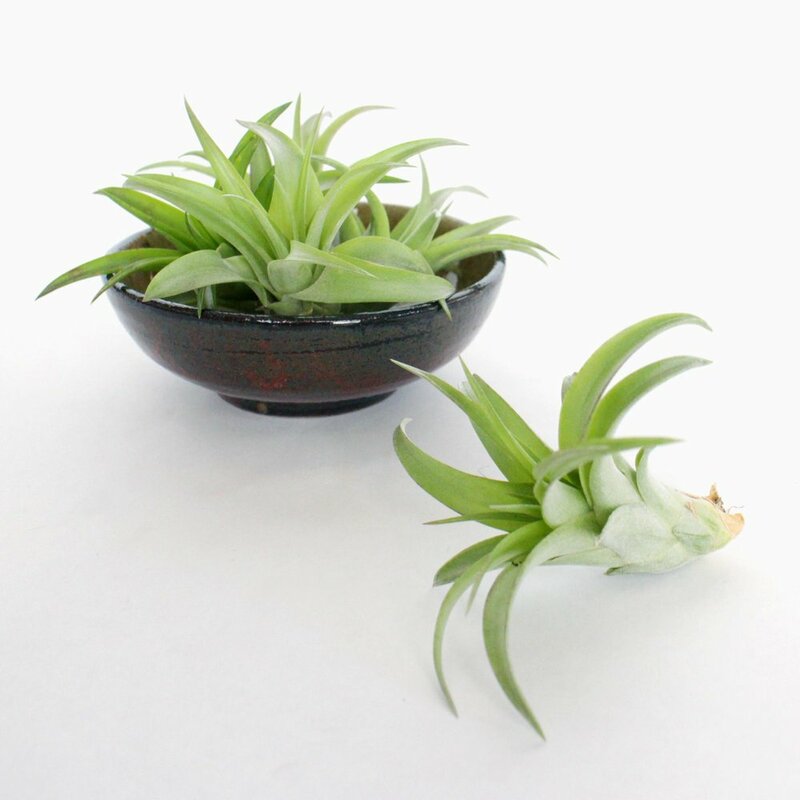 Air plants will quickly rot if they are allowed to stand in excess water. Return to holder only when the air plant is completely dry. Wrinkled or rolled leaves or dry tips can be a sign of dehydration. Misting between weekly waterings will provide a refreshing drink for thirsty plants. When possible, water in the morning. 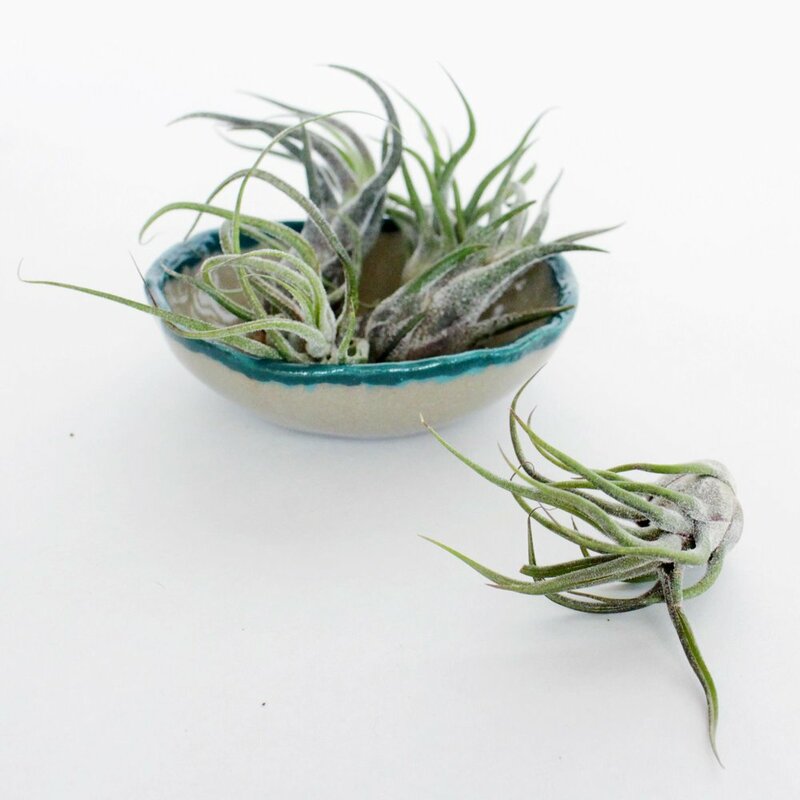 Air plants â€œbreatheâ€� at night and cannot breathe when the their leaves are wet. 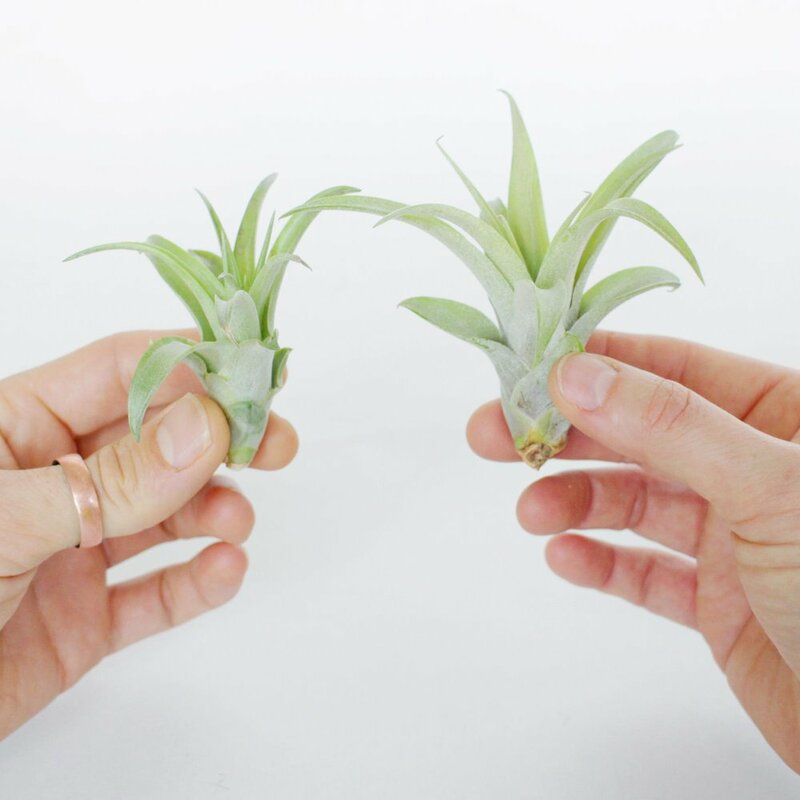 This may seem like a lot, but air plants are pretty easygoing. You shouldn't stress over the watering schedule or hire a plant sitter when going on vacation. 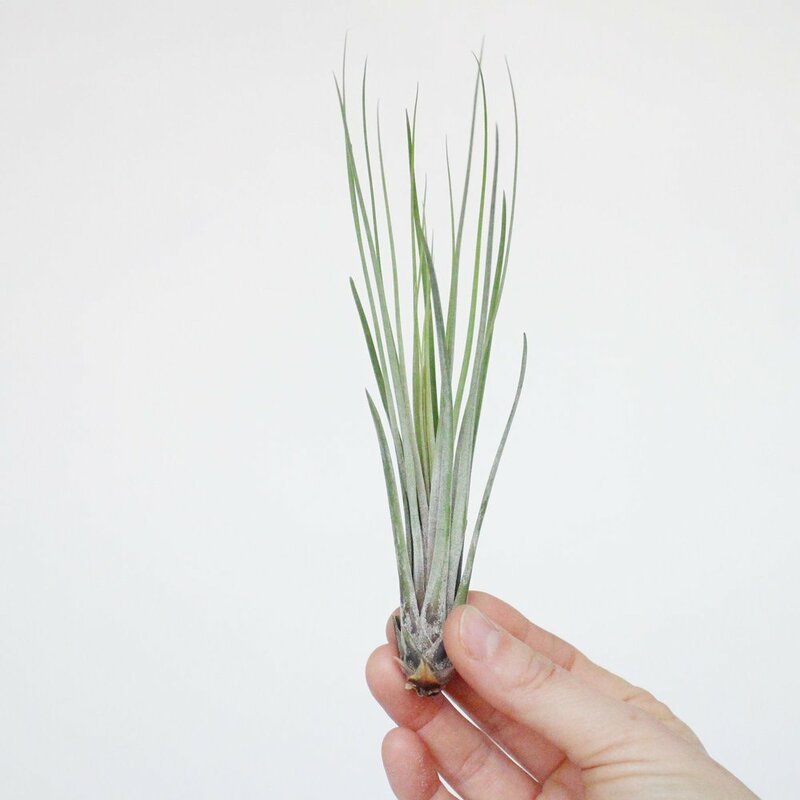 Air plants do best in warmer conditions with a range of 50-90ÂºF. As with all plants, fertilizing isnâ€™t entirely necessary but will boost plant vitality. To encourage growth and blooming, use a water-soluble fertilizer once a month by spraying directly on the plant after watering or by adding to water when soaking the plant. Do not fertilize more than one a month as the excess nitrogen could burn the plant. We recommend a low-nitrogen fertilizer, but any houseplant fertilizer will also work. We are currently working on a special blend that will be launching on our online shop very soon. 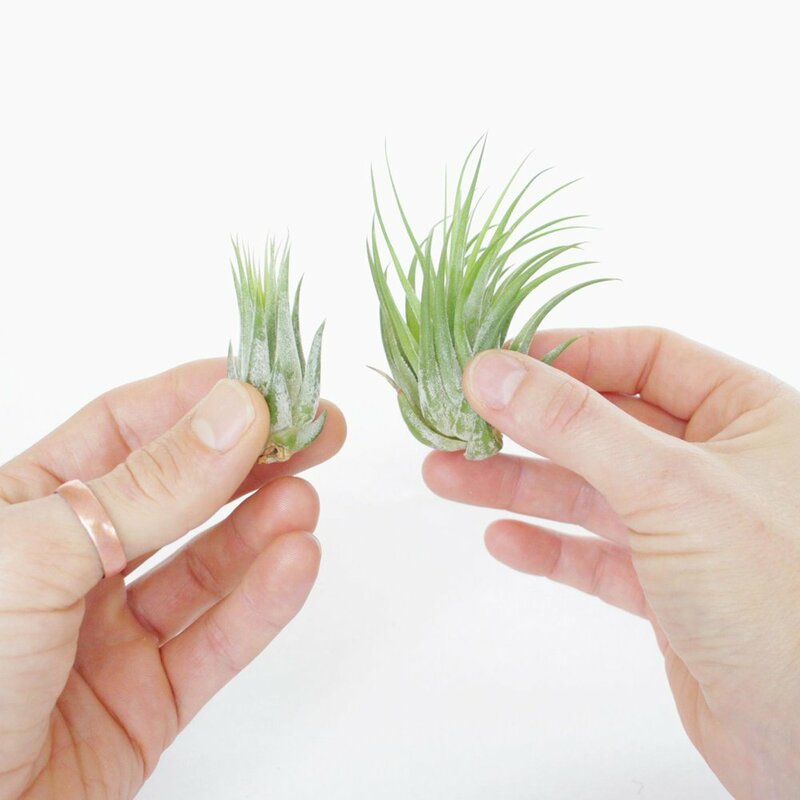 It is natural for the smaller bottom leaves of air plants to dry up as it grows and adjusts to its new home. Those leave can be gently pulled from the plant. If the leaf tips have dried, use clean scissors to clip the tip at an angle to leave a pointed edge to blend in with the rest of the foliage. A light grooming from time to time will not harm the plant. 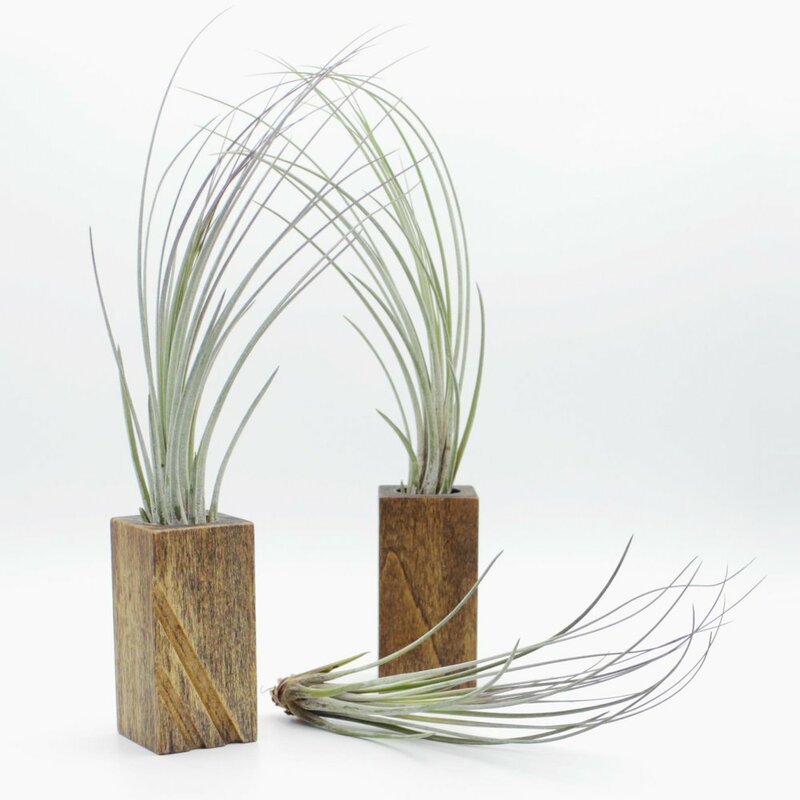 Some air plants have long â€œrootsâ€� at the base, which help anchor them as they grow. These roots are not necessary to maintain and can be trimmed down without harming the plant. Air plants can live for several years but will bloom only once in their lifetime, most likely between mid-winter and mid-summer. Depending on the species, the blossom last from a few days to a few months, and have radiantly bright colors of pink, red and purple. 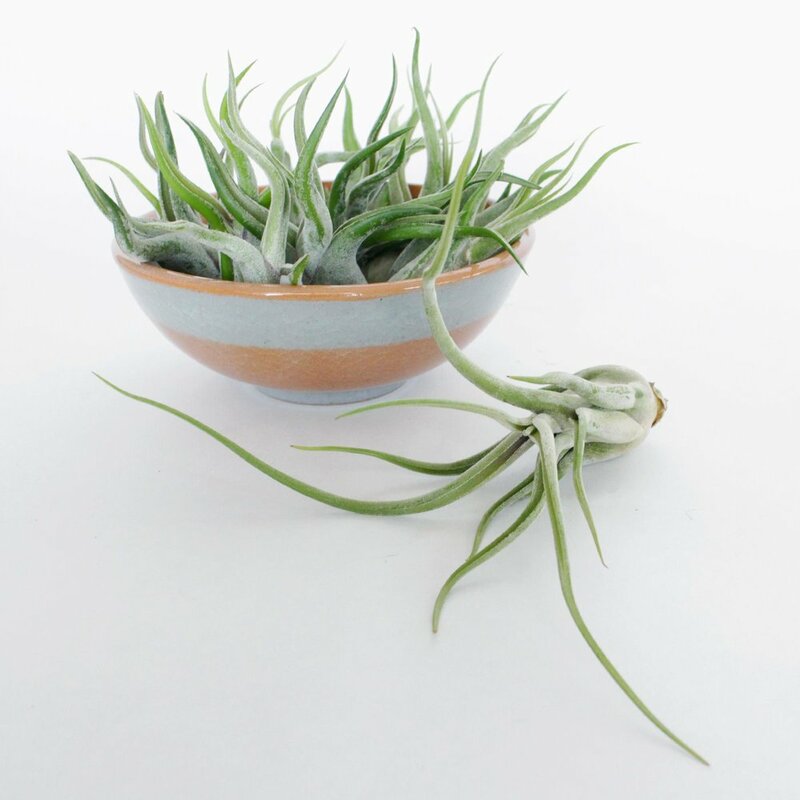 Blooming is the crest of the air plant lifecycle and the plant will eventually die. But not without producing 2-8 plant babies called â€œpupsâ€�. 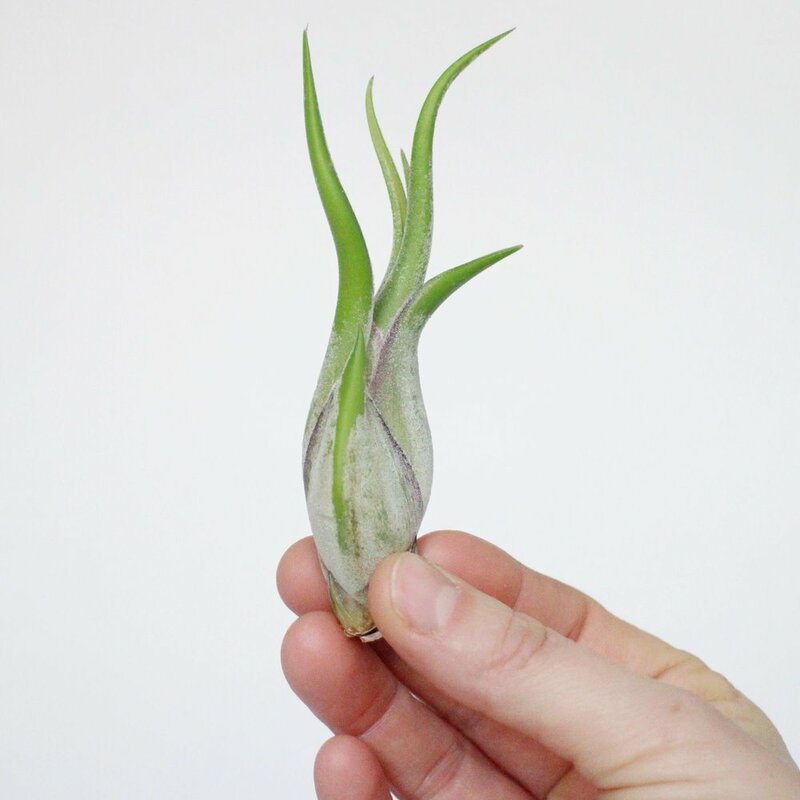 These baby air plants will be very small at first and grow to become their own mother plants. Pups can safely be separated from the mother plant when theyâ€™re about one-third its size. When an air plant is blooming it is best to mist rather than soak as the flower can rot. This dome shaped air plant originates in Columbia, where it attaches to cliff sides with its â€œrootsâ€�. It has wispy, soft leaves that gradate from silvery green to bright green at the tips. The base of the plant is compact and delicate with the leaves fanning out in all directions. The andreana plant is rare and will have a red blossom when it blooms. Its leaves can also have a pink tint to them, which is a sign the plant is about to bloom. Approximate plant size is 2" high. Brachycaulos is native to deserts and forests in Mexico, Central America, and Venezuela. This beautiful plant has wide, lush green leaves with hints of silver that will blush red when blooming or exposed to higher light levels. The leaves have a smooth waxy feel. Brachycaulos can tolerate small amounts of direct sunlight, but thrives in indirect sunlight to partial shade. Approximate plant size is 2.5-3" high. Butzii is native to Costa Rica and Mexico and is a fan favorite. Its reptilian-like appearance is very unique. The dense base is covered in plum and ivory spots that decrease in scale as the pattern travels up the tendrilled leaves. The lengthy leaves gently curve in all directions and become more wispy as the plant ages. We offer two size options: small (~4-5" high) and medium (~6-8" high). Native to Mexico, Cuba, and the Dominican Republic, this air plant is more likely to attach itself to rocks than trees. It has rigid, velvet-textured leaves that are silvery green and blush a beautiful peach when about to bloom. Capitata peach can grow to be quite large and can handle cooler conditions. We offer two size options: small (~2-3" high) and medium (~4-5" high). Caput medusae is native to Central America and Mexico where they grow on tree branches. 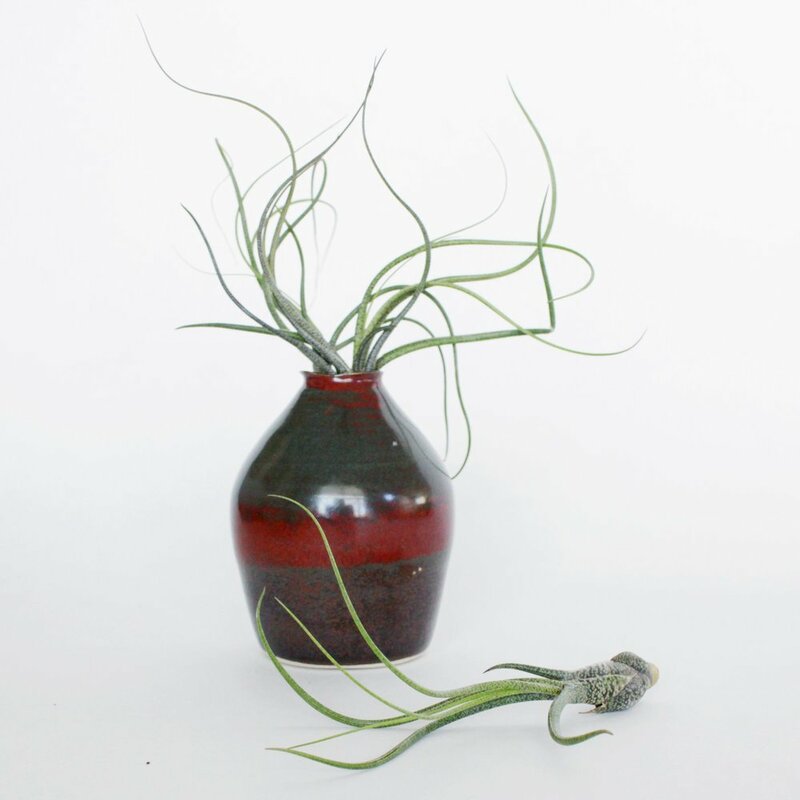 This plant gets its name from Medusa, a creature in Greek mythology whose hair was made of snakes, and is one of our most exotic looking air plants. The dramatic, sage green leaves edged in deep plum wrap around each other making a tight bulb at the base. The entire plant is blanketed in a soft fuzz and will produce a flame red spike and violet colored blossoms when in bloom. We offer two size options: small (~4-5" high) and medium (~6-7" high). Ionantha rubra is native to Central America and Mexico, and has also been naturalized in the southern United States in Texas and Florida. The leaves grow in a dense symmetrical rosette and can appear flower-esque. The leaves have a lenticular effect, appear to be different colors depending on which angle the plant is viewed. When about to bloom, the lower portion of the leaves turn a darker green and the tips blush deep plum. Approximate plant size is 1-2" high. Juncea is native to Guatemala, Bolivia and Mexico. The leaves grow tall and slender from a dense base, giving the plant a feathery look. The leaves are very sturdy and have a brown hue at the base that gradates into a beautiful sage green. Approximate plant size is 6-8" high. Pruinosa is native to South America, Central America, southern Mexico, the West Indies and Florida. The bulbous base supports soft, wavy leaves, giving the plant a very unique appearance. The plant is a deep green and appears to be covered in frost. When in bloom the centermost leaves turn a bright pink and will ultimately produce a deep purple blossom. Approximate plant size is 2-3" high. Ionantha scaposa, also known as kolbii, is native to the forests of Guatemala. This is a great plant for newbies as it is very hardy. The plant starts with a dense growth pattern of leaves that have a slight curvature. As the plant ages the leaves begin to branch out as the base widens. The color palette is rich with shades of vibrant green layered with silver fuzziness. When in bloom, the centermost leaves transition to brilliant red, orange and purple. We offer two size options: small (~1.5-2.5" high) and medium (~2.5-3.5" high). Velutina is native to desert woods of Chiapas and Guatemala. The leaves are wide and thick, growing in a slightly forward curvature from the base. This plant is velvety soft to the touch with silvery green hues that will transition to deep plum as it matures. When in bloom, the leaves will turn a yellow and pink creating quite a lovely display. Approximate plant size is 2-3" high. 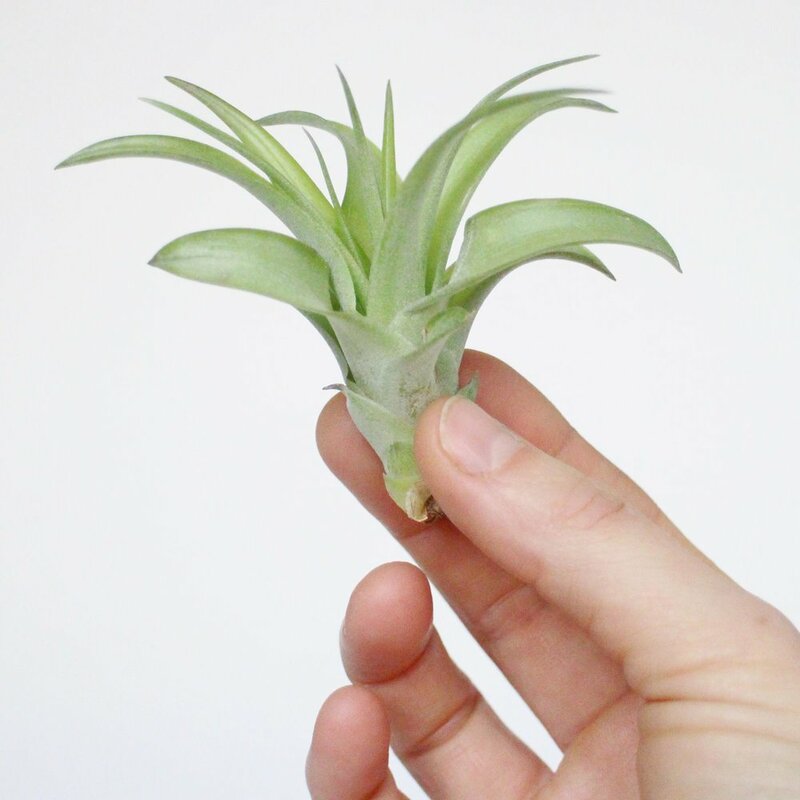 Xerographica is the queen of air plants and is native to southern Mexico, El Salvador, Guatemala and Honduras. The silvery soft green leaves are wide at the base and taper to a point, curling inwards in a striking sculptural rosette. New growth sprouts from the center creating a curvilinear form that gives the plant a wonderful sensation of movement. Xerographica will definitely be a focal point in any room. We offer two size options: small (~5-6" wide) and medium (~8-10" wide). This is the largest air plant we offer and it looks great sitting on its own.